We are the only multi instrument lesson facility in upper Sahali Kamloops. We have now moved locations and are the only multi instrument teaching facility in upper Sahali. Since 1997 Michael Turner and Turners Music Studio have been pioneering innovative and exciting approaches to conventional music lessons, recording, and performance. The studio includes multiple lesson rooms, a future vocal booth, and a comfortable waiting area. We have 4 qualified teachers ready to provide you with the instruction you've been looking for! Turners Music Studio is located at 795 Notre Dame Drive in Kamloops BC. 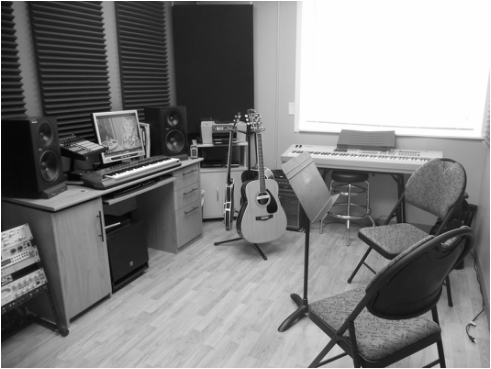 Turners Music studio has students and clients ranging from young beginners to advanced adults. Whatever your current musical ability or style of interest we can provide you with professional instruction and results! A peek into one of our studio rooms.